Jura Koncius featured it the July 26, 2007 Washington Post, as follows. 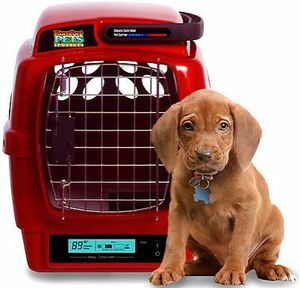 The Komfort Pets Carrier, billed as the first to offer heating and cooling, is being hyped by its creators as a product as revolutionary as the fax machine or cellphone. If you're a Labrador or a Siamese, maybe it is. The climate-controlled carrier uses patent-pending conduction/convection technology that turns on cooling when the temperature reaches 72 degrees and warms up when it's below 65. The product has had extensive testing and inspection by veterinarians, according to Bob Inello, chief executive of Komfort Pets, who says the carrier "can provide sanctuary in unheated garages" and is equally useful for homes, cars, boats and RVs. The smallest carrier (19-by-13), designed for lap dogs or cats, is available in ruby or silver for $399 through www.komfortpets.com and Amazon.com. Medium and large models will be out later this year, as will a metallic pink version worthy of a Paris Hilton spread in People magazine. Carol Boker, editor in chief of Pet Product News, says the carriers should be a hit with people who take their dogs or cats along on trips. "The trend of pampering pets shows no sign of slowing down," she notes. Comfort for your pet is priceless — but now affordable. The revolutionary Komfort Pets Carrier is the world's first climate-controlled pet carrier designed to automatically keep pets cool when it's too hot and keep them warm when it's too cold. Komfort Pets has pioneered a patent-pending technology to offer both heating and cooling capabilities for your pet's comfort. Our temperature control system is designed to complement the natural methods by which a pet regulates its own body temperature by using both conduction and convection simultaneously. We have incorporated this ingenious technology into the best-looking and most distinctive pet carrier in the marketplace today. The Komfort Pets Carrier can be taken or used almost anywhere. It is surprisingly affordable and can be used in cars, SUVs, RVs, rental cars, boats or in your home or garage to provide a comfortable cooled or heated sanctuary for cats, dogs, rabbits or just about any other household pet. The Komfort Pets Carrier can be customized for police and military applications and is available with an interlocking stackable top for the show dog circuit and other uses. Pls me the details about the products.